HARRISBURG – A sculpture crafted from nearly 1,000 pounds of butter was unveiled as the centerpiece of the 96th Pennsylvania Farm Show, which opens Saturday. The sculpture depicting a young 4-H member showing his prized calf at a county fair pays tribute to the 100th anniversaries of thePennsylvania 4-H and Pennsylvania State Association of County Fairs. Lt. Governor Jim Cawley and Agriculture Secretary George Greig unveiled the sculpture along with Pennsylvania Fair QueenClaire Werkiser of Chester County, and Pennsylvania 4-H State President Sarah Bassett of Northumberland County. “Pennsylvania has a rich agricultural tradition, and this sculpture pays tribute to the root of the industry – our young people and the educational programs and county fairs that give them opportunities to grow and learn,” said Cawley. More than 5 million people attend Pennsylvania’s 113 county and local fairs each year and 125,000 youth are enrolled in 4-H, many of whom exhibit their projects at fairs. Greig added that dairy is the largest segment of Pennsylvania’s agriculture industry, with 7,400 dairy farms and 540,000 dairy cows. Dairy farmers are an integral part of local communities, spend nearly 85 percent of their income close to home and recognize the importance of supplying quality products to their neighbors. 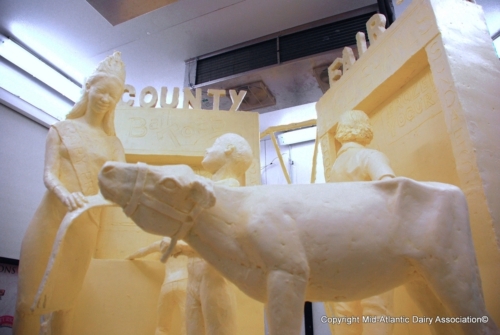 The butter sculpture was created by Jim Victor of Conshohocken, Montgomery County. He began crafting the life-size design in mid-December and finished just in time for the Farm Show. He also creates sculptures using chocolate and cheese. At the close of the eight-day show, the butter will be given to a Juniata County dairy farm. The butter will be put through a digester that will convert it to 65 kilowatt hours of electricity to operate the farm. Sponsored by the Mid-Atlantic Dairy Association and the Pennsylvania Dairy Promotion Program, the sculpture was crafted from butter donated by Land O’ Lakes in Carlisle, Pa.
Mid-Atlantic Dairy Association and Pennsylvania Dairy Promotion Program are funded by dairy farmers to promote dairy products. For more information, visit www.dairyspot.com. The 2012 Pennsylvania Farm Show is the largest indoor agricultural event in the nation, featuring nearly 6,000 animals, 10,000 competitive exhibits and 300 commercial exhibitors. The show runs Jan. 7-14 at the Pennsylvania Farm Show Complex and Expo Center in Harrisburg. Admission is free and parking is $10. Visit www.farmshow.state.pa.us for details about the show or to see a photo of the butter sculpture.